I received a press release for the new iOS app called Sidekick Cycle. The game is not only fun and exciting but it is all part of a major social change initiative. I personally bought a copy of the all because for every 387 downloads of the game a bicycle will be purchased for a child in an impoverished community. I’ve been playing the game and have found it pretty addicting and fun. You are a guy on a bike tearing through the African landscape. On your bike you may have a little rhino, cheetah or monkey and for some reason a Koala (not found in Africa). These are your sidekicks. These little guys help you as you ride. Maybe you need help grabbing coins, busting through rocks or even getting a second chance after a crash. 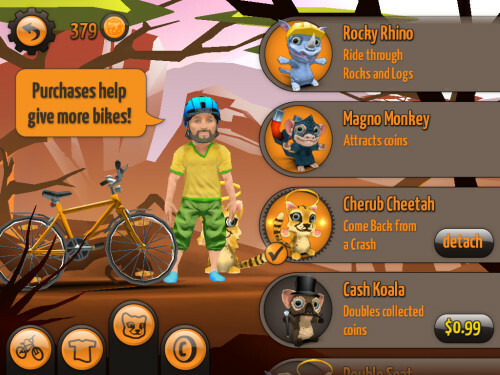 The sidekicks can help you as you ride, jump and flip your way across the Savannah. As you play you earn coins so that you can upgrade your bike, rider look and your sidekick. You can also spend money and buy upgrades. This is something I’ve seen in many games but not something that also counts towards social good. Buying upgrades helps to contribute to the purchase of more bikes. Minneapolis, MN –September 18, 2013– And they’re off! 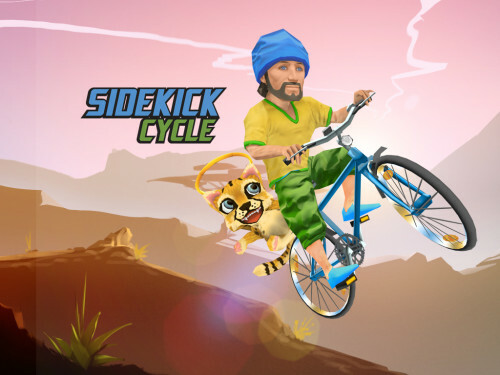 Sidekick Cycle, the inaugural mobile game from Global Gaming Initiative, is now available for download on iOS platforms. The title marks the beginning of GGI’s mission to build gaming experiences that connect digital-world customers to real-world causes. For every 387 downloads of Sidekick Cycle, GGI purchases one bicycle for a child in an impoverished community. 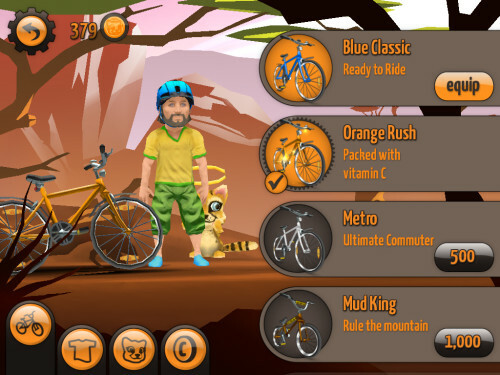 Sidekick Cycle is a one-touch downhill biking game where the player blazes a trail to victory on over 30 tracks in Africa and North America. Skills and bravery are needed to endure hazardous terrain while pulling off gravity-defying tricks and delivering bikes to kids in need. Bikes can be customized with an assortment of helpful Sidekick companion animals, each of which offers its own distinct ability, allowing users to customize their tactics by combining different powers for extraordinary results. Players can also personalize their avatars and rides. This is more than an addictive game, it is a vehicle to make a positive impact in the world. By purchasing Sidekick Cycle, players contribute: Global Gaming Initiative takes 50% of the proceeds from sales of the game and donates them to World Bicycle Relief, a non-profit group that has given over 120,000 locally assembled bikes to students, disaster victims and healthcare workers in Africa since 2005. The title also aims to raise awareness of the fact that bikes can make sure a kid attends school every day, as well as provide daily healthy activity. Global Gaming Initiative’s mission is to connect communities all over the world to make a difference. Developed by It Matters Games in Berlin, Germany, Sidekick Cycle is now available for the iPhone, iPad, and iPod Touch through the App Store for $0.99. It is a universal app that is GameCenter enabled. An Android version is coming this fall. For more information, please visit http://sidekickcycle.com or get updates at www.facebook.com/sidekickcycle. Global Gaming Initiative uses mobile gaming as a vehicle to connect people with causes that stimulate upward mobility in the developing world. It creates fun and engaging titles that incentivize charitable micro giving and raise awareness of economic and social issues. They offer an innovative, inclusive opportunity to impact collective change worldwide. 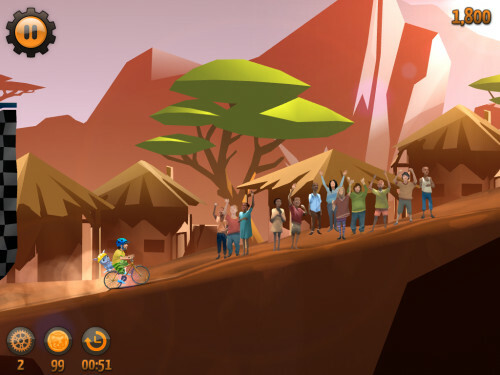 Its first game, Sidekick Cycle, an adventurous downhill bicycle racing title benefits World Bicycle Relief, a nonprofit group which provides rugged, locally assembled, specialty bikes to disaster victims, students, entrepreneurs and healthcare workers across Africa. Global Gaming Initiative is a for-profit company and privately funded. For more information visit http://globalgaminginitiative.com. Facebook: www.facebook.com/weplaytogive, Twitter: @ggiplaytogive.